QUITMAN, Ark. (AP) � In the past week, four 600- to 800-pound African lions believed to have some connection to a nearby exotic animal farm have been killed near this central Arkansas town. And residents say the terror may not be over because no one knows for sure whether more lions are on the loose. 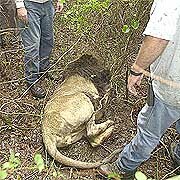 One of four loose lions shot and killed by law enforcement officers in an area north of Quitman, Ark. Lisa Vaughan says her log cabin in the woods was so peaceful that sometimes the only sound that could be heard was the trees swaying in the wind. "I had a terrible headache, and my blood pressure has been up. ... It's been a long ordeal," says Vaughan, whose husband, Johnny, killed two of the lions with his .30-06 rifle. "Everybody is scared around here," neighbor Arvil Skinner says. "People have to sit out with a high-powered rifle just to let their kids play in the yard. That's just how serious it is. It might be all right and it might not. They might still be out there. We just don't know." The Vaughans say they believe that the lions belong to animal farm operator Steve Henning, who moved in on the other side of the patch of trees almost a year ago. He brought with him 11 African lions, 30 tigers, five mountain lions and a lynx. Henning says the lions killed in the woods were not his. He speculates that someone who tried to give him lions last week turned them loose on the 44-acre property of Safari Unlimited, the lion and tiger farm he operates. The farm is not open to the public, Henning says. Aside from the pens where Henning keeps his cats, the property is not fully fenced. Neighbors express disbelief over Henning's response. "That really blows my mind how anyone could believe that story," Lisa Vaughan says. Henning was not able to give Cleburne County sheriff's deputies or the Arkansas Game and Fish Commission the name of a person they could track down, authorities say. "Mr. Henning told us the guy goes by different names, and he doesn't know where he lives," Deputy Jack Allen says. Sheriff Dudley Lemon, who has inspected Safari Unlimited, says he thinks Henning is telling the truth. But, he adds, believing Henning's story does mean more big cats could be roaming the woods. Johnny Vaughan says he will be the first to apologize to Henning if it's proven the lions that have been killed didn't belong to him. But he and his neighbors in this town of 700 people � located about 60 miles north of Little Rock � want local laws amended so that Henning can't keep lions and tigers in their neighborhood. "We've got to try and pass something to not only protect the people, but also to protect the animals," Johnny Vaughan says. "It's sad to think that someone can have that many animals but they don't need some sort of license."